This recipe is adapted from Dorie Greenspan's Around My French Table, and it was a revelation to me! I have never been a huge fan of lentils, but the French lentils du Puy in this soup have fantastic flavor and are much more interesting than the usual brown lentils from the store. I also love the seasoning here - the orange peel in particular is unexpected and oh-so-delicious. Since the soup doesn't contain any bacon or other meat, I like to float a little round of crispy pancetta on top of the soup to provide some textural contrast and yummy pork flavor. 1. Warm the oil in a Dutch oven over low heat. Add the onion, fennel, and carrot and stir the vegetables until they are coated in the oil. 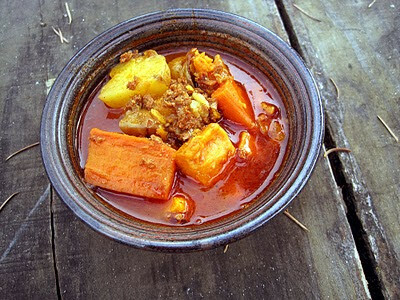 Cover the pot and cook, stirring often, until the vegetables are softened, 10 minutes. 2. Add the broth, lentils, and orange peel to the pot. Wrap the peppercorns, coriander seeds, and clove in cheesecloth and tie shut, or use a disposable tea filter. Add to the pot along with the ginger. Bring to a boil, and then lower the heat and simmer, covered, until the lentils are very soft, 60 to 90 minutes. Season with salt and pepper after about 45 minutes of cooking time. 3. Remove the orange peel and spice sachet. Working in batches, puree about half the soup in a regular blender or with an immersion blender. 4. Fry the pancetta in a non-stick pan over medium heat until crispy. 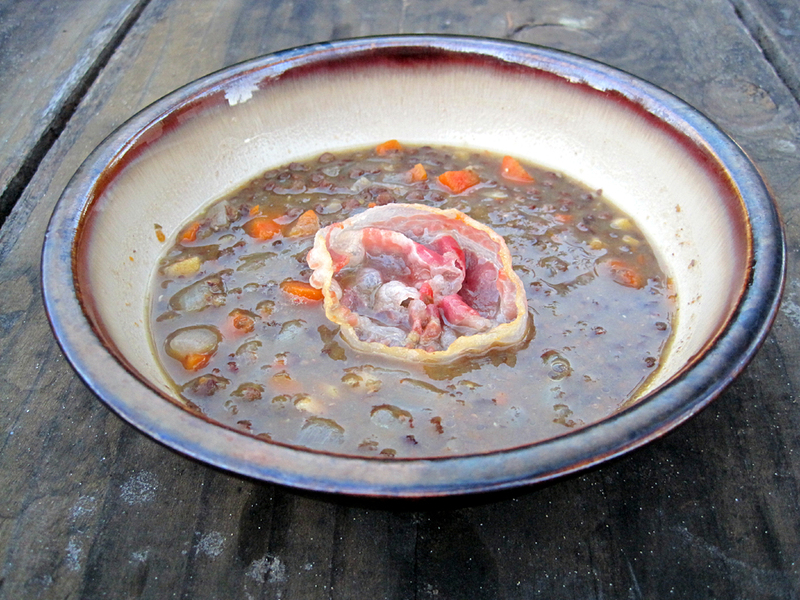 Ladle the soup into bowls and float a round of pancetta in each bowl. 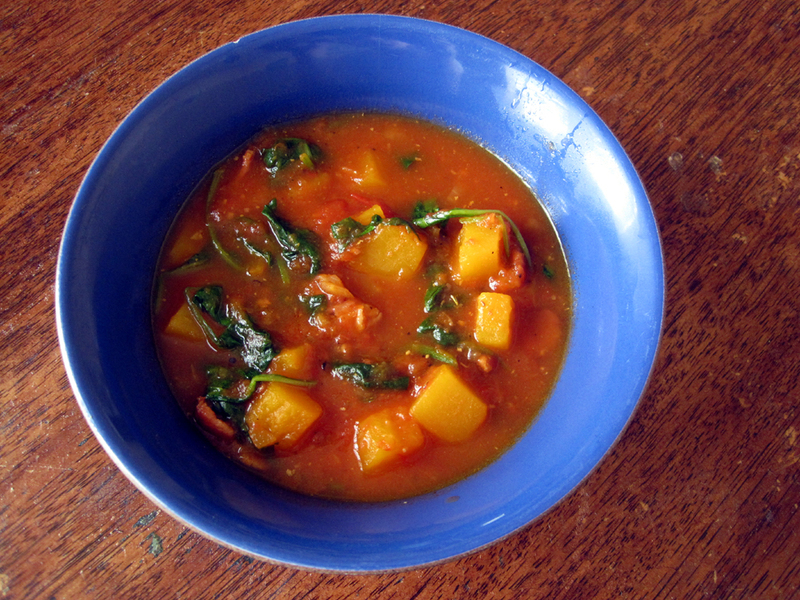 I'm sending this recipe off to BSI: Broth, hosted this week by Food for Thought. 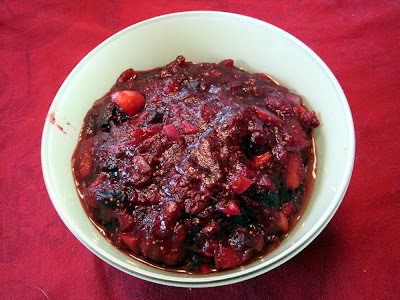 My aunt and I made this chutney for Thanksgiving dinner, but I'm posting it now because I think it would also be amazing with a New Year's day feast or any special occasion dinner. The chutney isn't too sweet, and the flavors are really complex and delicious. Although we (obviously) had it with turkey, I think it would actually also be quite good with other meats, like roast chicken or pork. I really like the fruits here - the tart cranberries plus the dried figs and golden raisins make the perfect combination of flavors. The fresh ginger also adds a really excellent zing. Add all the ingredients to a heavy-bottomed saucepan except the walnuts and thyme and bring to a boil. Lower heat to a simmer and cook for 20-25 minutes, stirring occasionally, until the cranberries are burst and the chutney thickens slightly. Remove from the heat and stir in the nuts and thyme. My boyfriend's dad makes this cheesecake every Christmas, so we decided to try it out a couple of weeks ago to get into the Christmas spirit. It is sooooo good - definitely a great Christmas tradition! 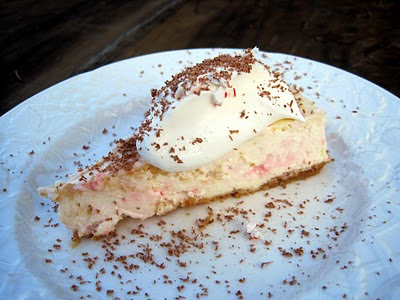 The cheesecake is fantastically creamy and a little tart from the sour cream. The texture was perfect even though we had to jury-rig a water bath with a cast iron skillet that didn't quite fit the springform pan we had. The crushed candy (either candy canes or Starlight mints) totally melts into the cheesecake, adding just the right amount of peppermint flavor. I also like that this cheesecake isn't insanely thick...some cheesecakes are so rich and tall that they're almost hard to eat - I've seen some recipes with upwards of 2 pounds of cream cheese! 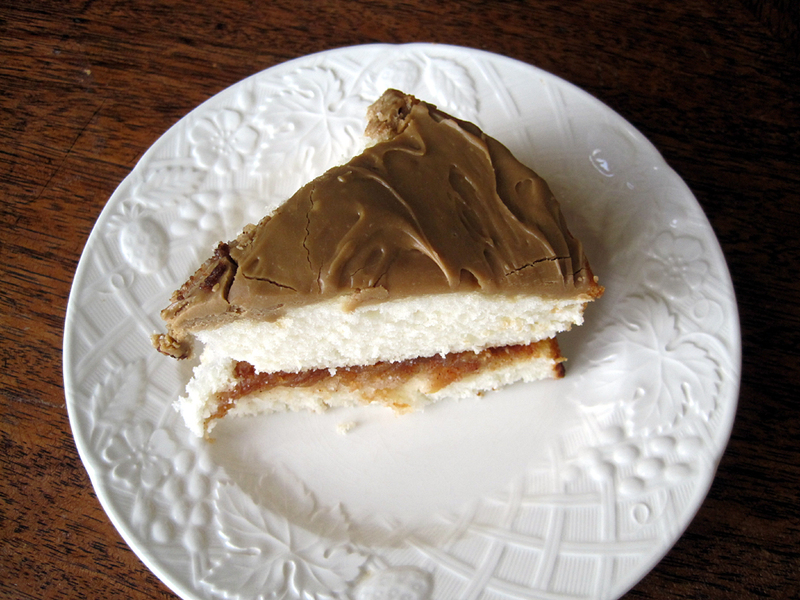 This one is certainly rich - it's cheesecake, after all - but not so much that you can't easily put away a couple of slices. 1. Place a large pan full of water onto the lowest shelf of the oven. Preheat to 325 degrees. 2. Blend together the graham cracker crumbs, 1/4 cup of the sugar, and 1/4 cup melted butter. Press evenly into the bottom of an ungreased 8-inch round springform pan. 3. In a food processor, combine the sour cream, remaining 1/2 cup sugar, eggs, flour, and vanilla until smooth. Add the cream cheese and blend, being careful not to over-blend. Blend in the 2 T melted butter until smooth. Stir in the crushed candy by hand. Pour the mixture onto the crust. 4. Bake the cheesecake 45 minutes until set. Turn off the oven and open the oven door. Leave the cheesecake in the oven to cool, which will minimize cracks. 5. Remove the cheesecake from the oven and loosen the side of the pan. Retighten the pan, cool completely, and then chill at least 4 hours or overnight. Decorate with whipped cream, chocolate curls, and chopped candy canes. As to the dish, it was really delicious. I love preparing fish for dinner because you can get a lot of flavor for little effort. Salmon is the perfect choice here to stand up to the strongly-flavored topping of shallots and dijon mustard. The shallots are pretty strong because they go onto the fish raw and get don't get cooked too much in the oven; be sure to mince them finely or at even saute them briefly before mixing with the mustard sauce, especially if you're not a raw onion fan. 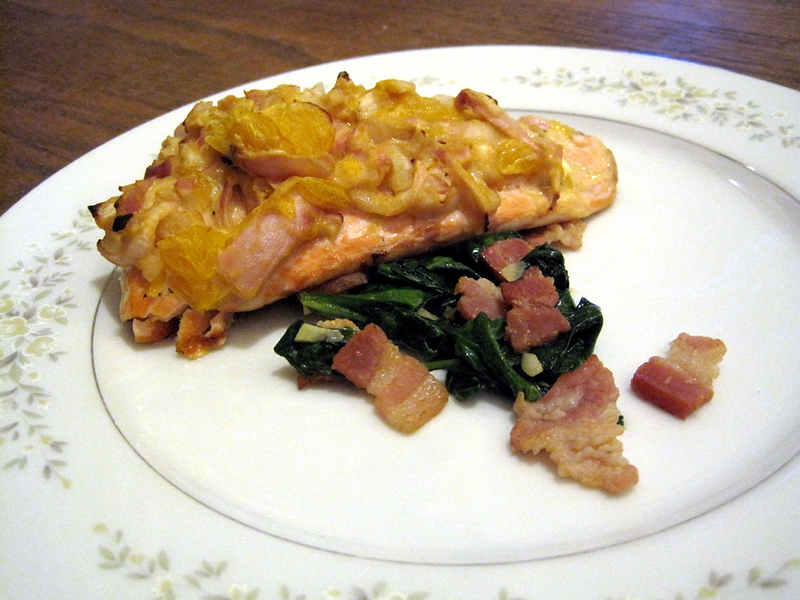 The spinach makes a quick and delicious side dish - and I definitely recommend springing for the real bacon! foil and spray with cooking spray. 2. In a small bowl, stir together the shallot and mustard. Add the orange or tangerine segments and toss to combine. Season with salt and pepper. 3. Lay the salmon skin-side-down on the baking sheet and season with salt and pepper. Spread with the shallot-mustard mixture, spreading to create a thick layer over the whole surface of the fish. 4. Cook until the salmon is just cooked through, about 8 minutes. 5. Meanwhile, prepare the spinach. Heat a non-stick pan over medium-high heat. Add the bacon and saute until it just starts to get crispy. Add the garlic and saute for about 1 minute, until softened. Add the spinach and saute until wilted. 6. Divide the spinach among two plates and top each with a piece of salmon. Tim and I wanted to make a healthy lunch last weekend after making peppermint cheesecake (recipe up soon!). 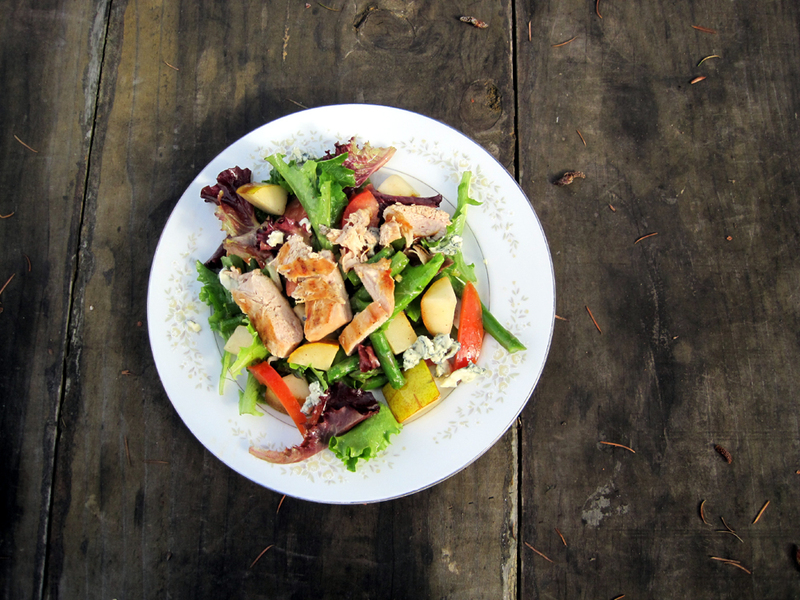 We did our best to recreate one of his favorite salads from Mixt Greens, with a few changes. I cooked up a chicken breast on my grill pan, which really gave the chicken great flavor - I'm really impressed at how much "grilled" flavor you can get from it without there actually being smoke or charcoal. The chicken was combined with steamed asparagus, fresh pears, baby greens, and a little blue cheese for the perfect salad. I added tomatoes to mine, but Tim didn't since he is anti-tomato. :) (I actually forgot and tossed them with the salad...oops. That's okay, more for me!) Overall, this was a tasty, healthy lunch that definitely satisfied - and deserved cheesecake for dessert! One tip - if your pear is a little underripe, saute it in a bit of oil for a few minutes while the chicken is cooking and it will soften right up. 1. Season the chicken breast with salt and pepper, and then grill on a grill pan (or cook in a saute pan) until cooked through. 2. Meanwhile, steam the asparagus until tender and then cut into inch-long pieces. 3. If the pear is underripe, saute for a few minutes in a little oil (or use oil spray on a nonstick pan). 4. 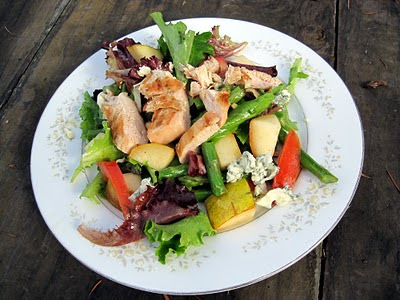 Toss together the asparagus, pear, tomato, and baby greens, and then add about half the vinaigrette. Toss to combine, and add more dressing if needed. Divide the salad among two places. 5. Top with crumbled blue cheese. Slice the chicken, and place on top of the salad. Combine everything in a jar with a tightly fitting lid and shake until well combined. Dip a piece of lettuce into the dressing to taste, and adjust to get the flavor you like. I really like this pasta sauce because it's very easy to make in just a few minutes, but it's also different than the usual "pasta with sauce" that seems to be the stand-by of lazy evenings. The sauce is fairly subtle, so I'd definitely recommend sticking with angel hair pasta rather than something chunkier, and be sure to serve with lots of cheese grated on top. Unlike some pesto sauces, this one keeps well in the fridge already tossed with the pasta, so you can mix up all the pasta and sauce and easily heat up any leftovers for lunch the next day. Although I didn't try it, I think you could probably cut down on the amount of olive oil in the sauce to make this a bit healthier. Either way, I definitely give this two thumbs up for the unique, yummy flavor and ease of preparation. 1/2 cup grated pecorino cheese, plus more to serve. 1. Toast the pine nuts until lightly browned in a dry skillet over medium heat. Combine the pine nuts with the roasted peppers, garlic, and whole basil leaves and then blend with a hand-held blender, full-sized blender, or food processor. Add the oil and cheese and puree until chunky. Season with salt and pepper. 2. 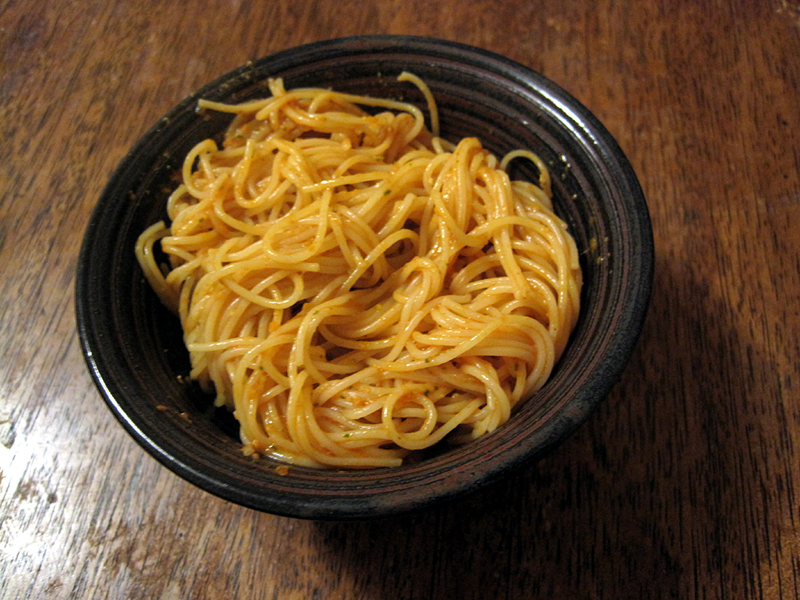 Cook the pasta in boiling salted water until al dente. Drain, and then add the pesto. Toss to combine, and serve with more grated cheese. I made these muffins a few weeks ago for a workshop I participate in at my school. They have great holiday flavor that's bright enough to wake you up in the morning! 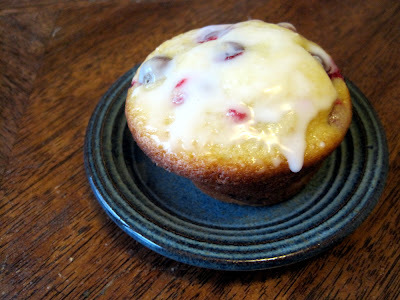 I love the tart cranberries and lemon flavor combined with the sweet glaze. These muffins also look really festive with the big dots of red scattered throughout them. 1. Preheat the oven to 350 degrees. Whisk together the yogurt, sugar, salt, and eggs in a large bowl. Add the zest and vanilla and whisk to combine. 2. In a separate bowl, whisk together the flour and baking powder. Add the flour mixture to the wet ingredients and stir together until just combined. 3. Add the oil and mix until the batter is just combined. Fold in the cranberries. 4. Bake 20-25 minutes until a tester comes out clean. 5. Make the glaze. Whisk the sugar with a little bit of lemon juice at a time until it reaches a drizzling consistency. Drizzle over cooled muffins. I'm sending this post off to BSI: Cranberry! I was instantly drawn to this recipe when paging through Food and Wine magazine. It looked full of flavor and also fairly healthy. I downsized the recipe a bit to fit into my Le Creuset cast iron grill skillet (which I won a while back from a fantastic giveaway that More than a Mount Full and CSN put on - thanks!). I was very happy with the result - the greens were alternately juicy or a bit crispy, the bread was crunchy and yummy, and the raisins and capers made everything much more interesting and flavorful. I'd just change two things next time. The capers were still pretty salty even after rinsing, and so the dish ended up being a little too salty. Next time I'd use capers in brine or wash them much more carefully. Also, the chicken breast dried out a little from all the time in the oven. 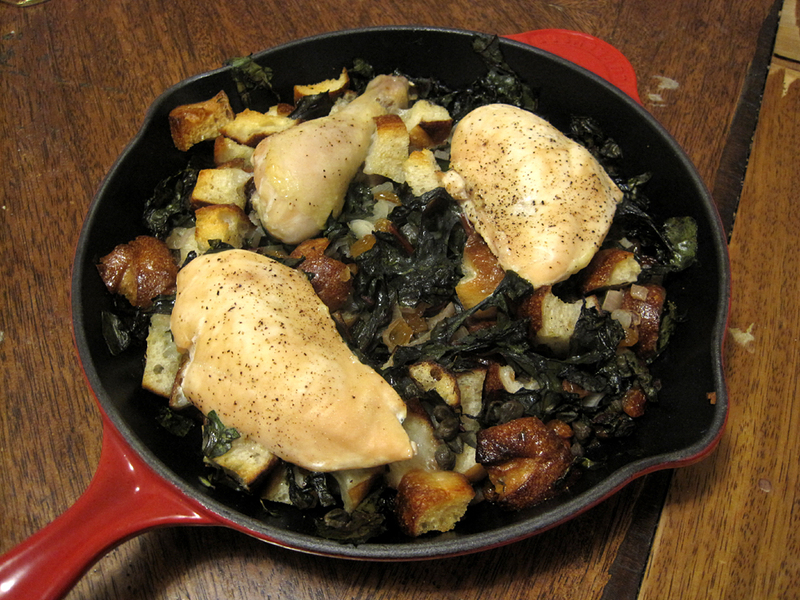 I'd probably use skin-on chicken if I made this again, and just remove the skin before serving. Other than that, this was a really yummy dish that was easy to put together. Feel free to use whichever chicken pieces you most like - you could probably fit enough chicken for 3 people on this amount of greens if you wanted to, or double everything and use a large pan to make enough for 4-6. 1. Preheat the oven to 350 degrees. Toss the bread, oil, capers, raisins, chard, shallots, garlic, and thyme together in a large bowl. Season liberally with freshly ground black pepper and with just a pinch of salt. Spread into a cast-iron skillet (or another oven-safe dish). 2. Season the chicken with salt and pepper and arrange over the bread. Cover with parchment paper, and cover with an oven-safe lid. Bake 35 minutes. 3. Remove the lid and parchment and increase the oven to 400 degrees. Bake about 10 minutes more, or until the chicken is golden and cooked through. Remove from the oven and let stand for about 5 minutes before serving. This coffee cake from Mollie Katzen is super light and fluffy with a tasty hazelnut crunch on top. Although it's still definitely a "treat" for breakfast, it's definitely lighter than many sorts of coffee cake as it's made with low-fat buttermilk (or skim milk mixed with lemon juice) and the topping contains no butter. Sadly, it's entirely addictive so any "light" factor is counteracted by the extra piece you're bound to eat. 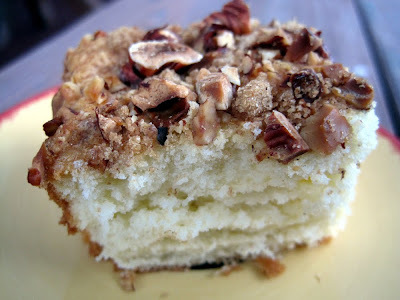 :-D In any case, this coffee cake is easy to whip up in the morning and an excellent addition to any breakfast spread. We enjoyed it for a special New Year's morning breakfast - yes, last New Year, I'm very behind on posting this one! - with mom, dad, and and grandma. Yum! 1. Preheat the oven to 350 degrees (or 325 degrees for a glass pan). Lightly spray an 8-inch pan with nonstick spray. 2. In a large bowl, beat the butter on high speed until fluffy. Add the sugar and continue to beat for another few minutes. Add the eggs one at a time, beating well after each, and then beat in the vanilla. 3. In a second bowl, whisk together the flour, salt, baking powder, and baking soda. Set aside. 4. Add the dry ingredients alternating with the buttermilk (flour-milk-flour-milk-flour), mixing just to blend after each addition. 5. Scrape batter into pan, spreading evenly. 6. 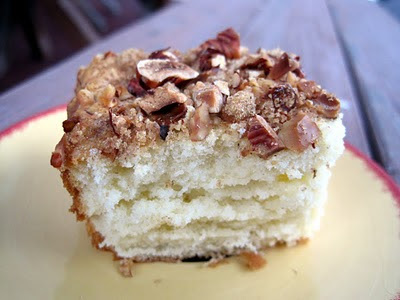 Mix together the sugar, cinnamon, and nuts and sprinkle over the coffee cake. 7. Bake 20-25 minutes, or until a tester comes out clean. Cool a few minutes before serving. 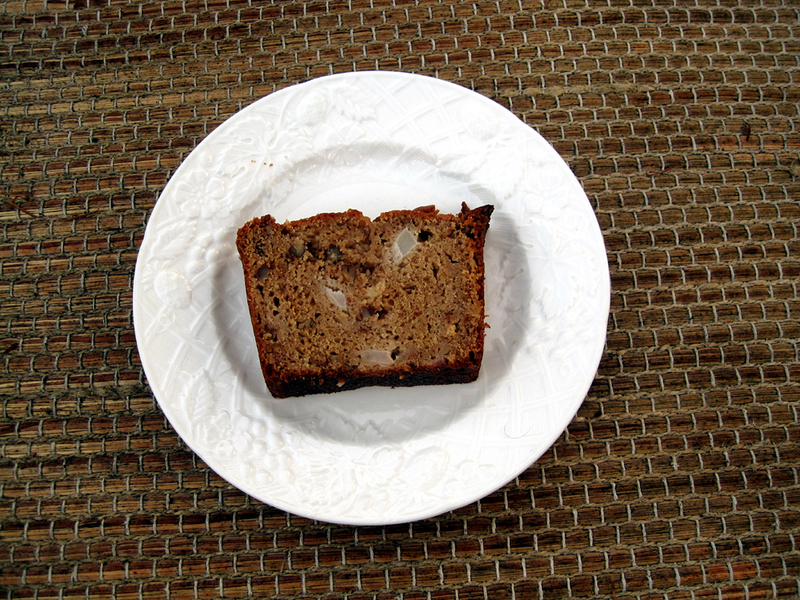 Tim bought me a box of tasty pears, and while I consumed most of them plain, I also used a couple of them in this fantastic quick bread. It's nice and sweet with just the right amount of spice and a good crunch from the pecans. 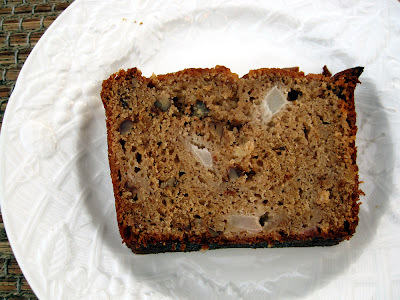 I love how the pears are used in two ways - grated to keep the bread moist (much like the bananas in banana bread), and chopped to provide little bursts of pear flavor all throughout the bread. The bread is wonderful warm, but also keeps well and is yummy cold for a few days (if it lasts that long!). Note: You'll need 2-3 large pears for the grated and diced pear combined. 1. Preheat the oven to 350 degrees and spray a loaf pan with oil. 2. Whisk together the flour, salt, baking soda, baking powder, cinnamon, and cardamom. Add the pecans and toss to combine. 3. In another large bowl, whisk together the oil, buttermilk, egg, egg white, sugar, grated pear, and vanilla. Stir the dry ingredients into the wet ingredients until just combined. Fold in the diced pears, again until just combined. 4. Scrape the batter into the oiled pan and bake for about 1 hour, until a tester comes out clean. Sometimes you just have a lot of odds and ends of vegetables that need to be used up before they go bad, and that's when you turn to soup. I was in just this situation when I created this soup recipe. 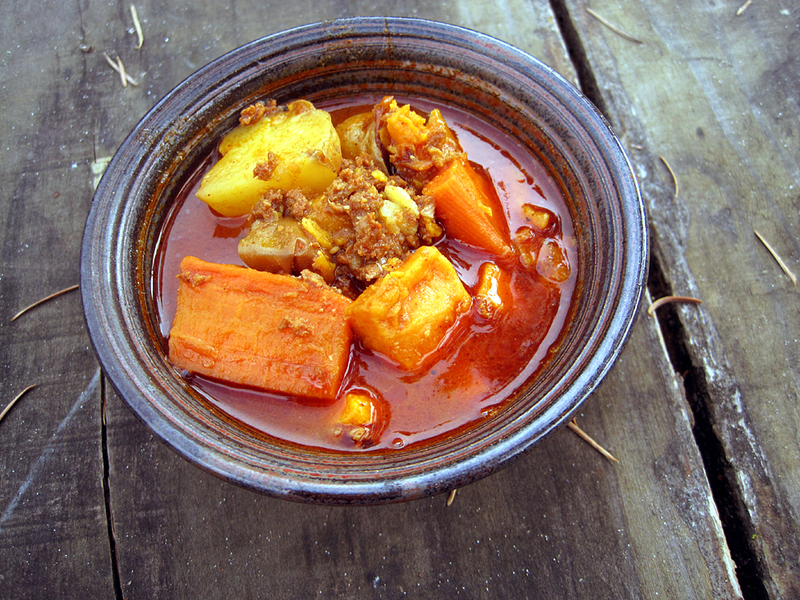 Luckily, it turned out to be absolutely delicious, with a nice meaty flavor from the bacon, acidity from the tomatoes, and sweetness from the squash. Obviously, this is the sort of recipe where you should substitute whatever veggies you have around that need to be eaten, or change the spices around to suit your taste. 1. Heat a little olive oil in the bottom of a non-stick saucepan. Add the shallots, and saute until softened and starting to brown. Drain on a paper towel. 2. Wipe the pan clean and add the bacon. Saute until browned, and then add the squash. Saute for a few minutes, adding more oil if needed, until it begins to soften. Add the tomatoes, chicken broth, thyme, and vinegar, and then season with salt and pepper. Bring to a boil, and then simmer until the squash is cooked through and the liquid is somewhat reduced. 3. At this point, you can puree some or all of the soup with an immersion blender if you like - I pureed some of it while leaving some of the squash chunks whole. Stir in the spinach until it wilts, taste for seasoning, and serve. Wow, it's been way too long since I've posted! I blame my boyfriend and also the Giants! It was a great series, but I've been bad about doing a lot of cooking lately because I've been busy hanging out with Tim, watching baseball, and of course trying to get work done. However, I'd say this soup is worth waiting for - I made it a couple of weeks ago and ate some at the time and froze a serving of it for later, which I ate for lunch today. It freezes quite well, and overall the soup has great flavor. Roasting the veggies before adding them to the soup gives a nice depth of flavor you don't get just from boiling them in broth. Plus, fingerling potatoes are pretty much one of my favorite foods in the world. Overall, this is a great fall soup that will keep you warm on a chilly day. 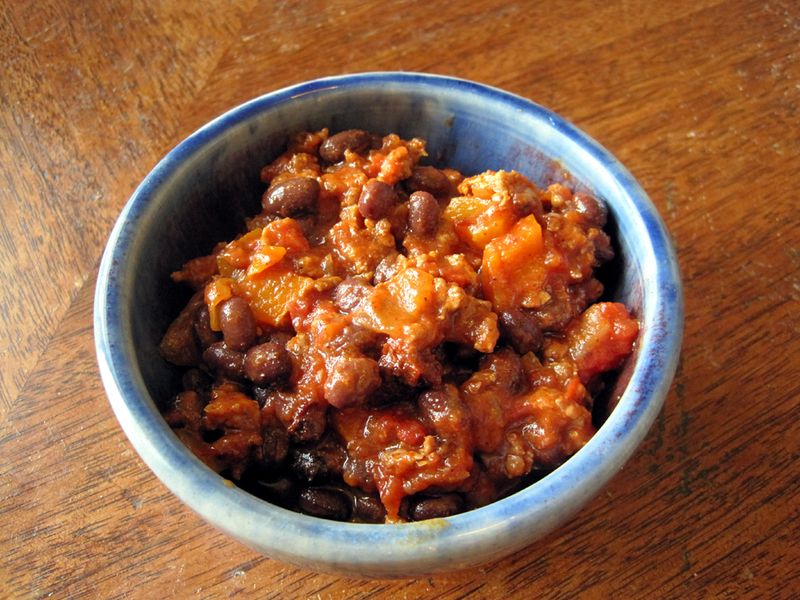 The chorizo is excellent, but you could substitute in any favorite sausage that you prefer. 1. Toss the carrots, potatoes, sweet potato, bell pepper and garlic cloves with olive oil and spread out on a large sheet pan. Season with salt and pepper. Roast in a 400 degree oven until tender. 2. Meanwhile, saute the chorizo in a non-stick soup pot until it is browned. Add the carrots, potato, and sweet potato. Allow the pepper and garlic to cool slightly. Peel the garlic, mash, and add to the soup. Cut the pepper open, remove the seeds, and chop into bite-sized pieces. Add to the soup along with the chicken broth. 3. Bring to a boil, and then simmer to allow flavors to combine. Smash a few of the veggies with a potato masher or spoon to thicken the broth, if needed. 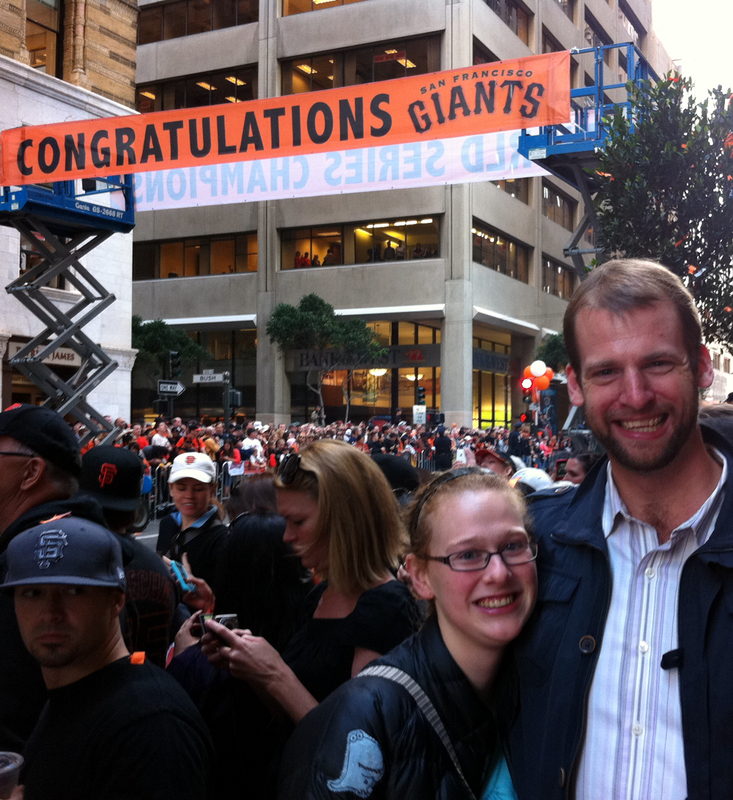 Tim and I celebrate the Giants victory at a parade in San Francisco. Go Giants! This recipe is really easy to pull together either for a quick dinner or to portion out for lunches during the week (like I did). It's fairly spicy, so feel free to eliminate the jalapeno or reduce the chili powder or chipotles if you like. Or just serve it with lots of sour cream. :) I vaguely followed this recipe from Martha Stewart when making the chili, but I decided on ground chicken since ground meat says "chili" to me more than cubes of chicken and made various other substitutions based on what I had in the fridge/pantry. Heat the oil in a non-stick saucepan, and then add the onion and pepper. Saute until softened, and then add the chili powder and jalapeno. Saute for a minute or so, and then add the chicken. Saute, stirring often to break up the meat, until it is cooked through. Add the chipotles, tomatoes, and black beans. Bring to a boil, and simmer for about 10 minutes (or longer). Remove the jalapeno halves before serving. This quick summer salad is really delicious and it's a great way to add more fruits and veggies to a meal. It would also be very easy to scale up in order to make enough for more people. Of course, it will be best if you get the most perfectly ripe, amazing peaches and tomatoes, but if you can't quite find those, just let the salad marinate in the vinegar for a little longer and it will still be very tasty. 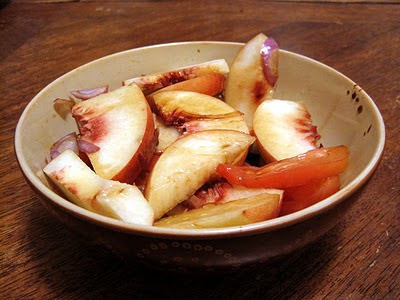 Toss the peach slices, tomato slices, and onion together in a bowl. Drizzle over the oil and vinegar, toss again, and then top with salt and pepper to taste. 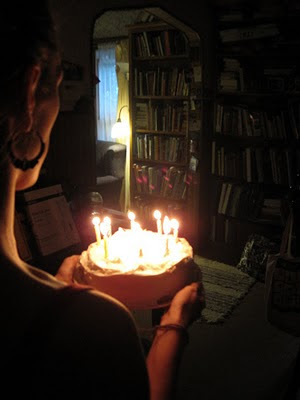 My birthday is today, 10-10-10! For such a great date, I had to have a great party! I went with a wine-and-cheese theme. Tim and I picked out 10 amazing cheeses at Cheeseboard, our local cheese shop, and I also baked two cakes. This caramel apple cake was my favorite, although the chocolate cake, which I'll post soon, was the crowd favorite (you can never go wrong with chocolate!). The cake itself is Dorie Greenspan's perfect party cake - which truly lives up to its name. I've made this cake for lots of parties, and it always comes out perfectly and is easy to pair with lots of different flavors. Here, it's filled with a sweet apple filling, and topped with my favorite brown sugar frosting. These were the perfect flavors for fall, and I was very happy with how everything came together. 1. Center a rack in the oven to 350 degrees F. Spray two 9-inch round cake pans with cooking spray with flour (or butter and flour the pans). Set aside. 2. Sift together the flour, baking powder and salt and set aside. Whisk together the milk and egg whites in a medium bowl and set aside. 3. Put the sugar and the butter in the bowl of an electric mixer and, working with the paddle or whisk attachment, or with a hand mixer, beat at medium speed for a full 3 minutes, until the butter and sugar are very light. Beat in the extract, then add one third of the flour mixture, still beating on medium speed. Beat in half of the milk-egg mixture, then beat in half of the remaining dry ingredients until incorporated. Add the rest of the milk and eggs, beating until the batter is homogeneous, then add the last of the dry ingredients. 4. Finally, give the batter a good 2-minute beating to ensure that it is thoroughly mixed and well aerated. Divide the batter between the two pans and smooth the tops with a rubber spatula. 5. Bake for 30 to 35 minutes, or until the cakes are well risen and springy to the tough – a thin knife inserted into the centers should come out clean. Transfer the cakes to cooling racks and cool for about 5 minutes, then run a knife around the sides of the cakes, unmold them and peel off the paper liners. Invert and cool to room temperature. Combine all the ingredients in a saucepan over medium-low heat. 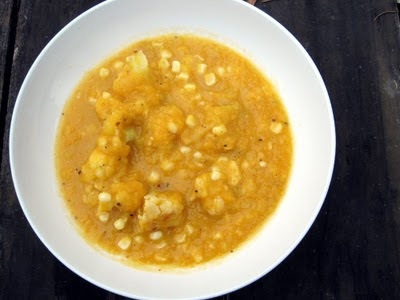 Cook, stirring often, until the apples are very tender and the liquid is mostly reduced. Note: Do not make the frosting until the cake is assembled and ready to frost, as it must be used immediately. 2. Remove from heat, and beat the frosting with an electric mixer for 6-8 minutes, until lightened in color and thickened to a spreading consistency. The frosting should be completely cool at this point. Frost the cake immediately, before the frosting forms a crust. Place one cake on serving tray. 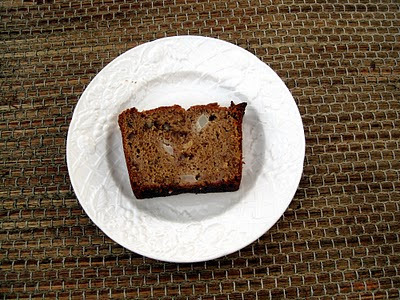 Spread the cooled apple mixture over the cake in an even layer. Top with the remaining cake layer. Spread the frosting over the cake quickly, as a crust will form as it cools. These enchiladas are unusual and very tasty. They're easy to pull together, and also easy to make for just one or two people, or for a group. I really like the filling combo of the creamy sweet potatoes, slightly spicy peppers, and chicken, and it contrasts well with the acidic green sauce. These enchiladas are great to try when you're in the mood for Mexican but want something a little different. They're not too spicy, so feel free to add more jalapeno to the sauce if you like. 2. Place the tomatillos in a bowl of hot water, and let sit for about five minutes. Slip off the husks, remove any stems, and wash well. Place in a sauce pan with the garlic, onion, jalapeno, and chicken broth. Bring to a boil and cook, stirring often, until the tomatillos are soft and have lost their bright green color. The liquid should be almost entirely reduced. Puree with an immersion blender until smooth. 3. Soften the tortillas in the microwave for about 30 seconds. Dip each tortilla into the sauce, and then fill with a quarter of each of the filling ingredients. Roll up and place in an oil-sprayed small casserole dish. Repeat with remaining tortillas. 4. 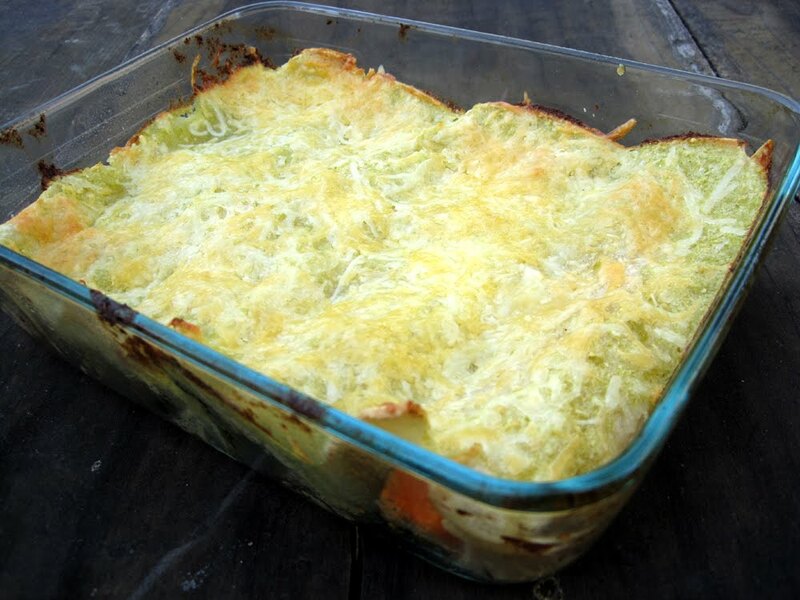 Pour a bit more tomatillo sauce over the enchiladas so the enchiladas are well covered. You will have quite a bit of sauce leftover. Sprinkle with the remaining 1 ounce cheese. Bake until the sauce is bubbling and the cheese is melted, about 20-30 minutes. I love polenta, and adding fresh corn to it makes it even tastier! It's such a comforting food, and I really like that any leftovers can be chilled and then fried up for breakfast the next morning. 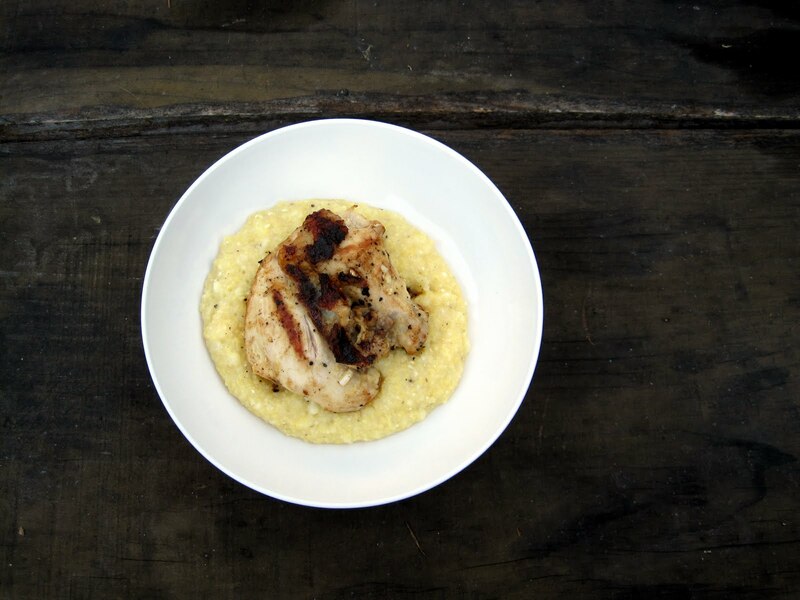 Here, creamy polenta is paired with grilled mustard chicken. I tried this recipe to give my new grill pan a spin, and I'd have to say it was not a big success. I had some bone-in, skin-on chicken from the farmer's market, and I think the meat was just too awkwardly-shaped to cook evenly in a good amount of time. The flavors were great, but next time I'd try boneless chicken and make sure it was an even thickness before trying to grill it. With that caveat, I think the combination of lemon, garlic, and mustard was a great one both with the chicken and the slightly sweet polenta. Next time, I'd just use a different cut of chicken or roast it in the oven instead of grilling. 1. Whisk together the mustard, lemon juice, and garlic clove. Rub onto the chicken, both under and over the skin. Season with freshly ground black pepper and a bit of salt. Marinate in the refrigerator for 6-8 hours, or use immediately. 2. Meanwhile, make the polenta. Bring the water to a boil. Add the polenta gradually, whisking constantly, until incorporated. Add the salt and sugar, return to a boil, and then reduce heat to a simmer. Cook, stirring frequently, until the polenta is creamy, about 30 minutes. Add the corn and cook a further 5 minutes. Season with freshly ground black pepper. 3. While the polenta is cooking, grill the chicken. Remove the chicken from the fridge about 15 minutes before ready to cook. Grill on a grill or grill pan drizzled with olive oil, or roast in a 400 degree oven in a small, oiled pan until cooked through. 4. 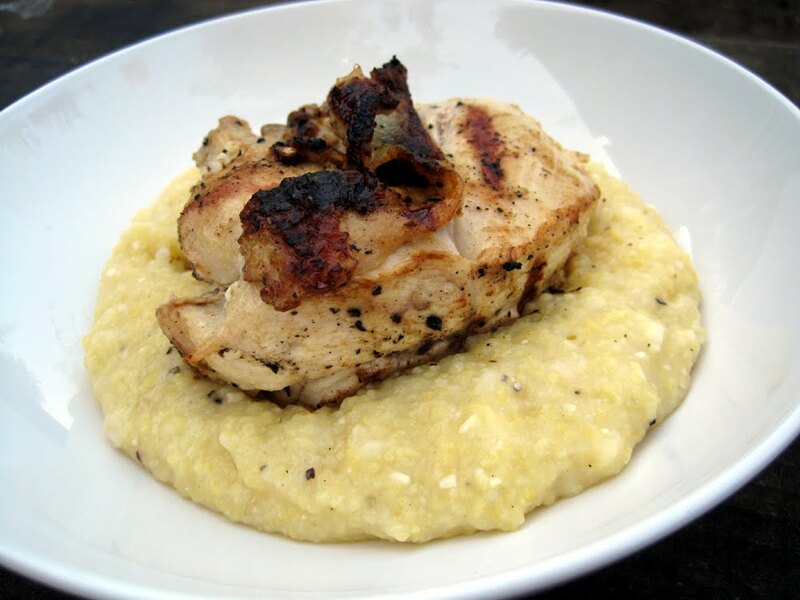 Divide the polenta between two bowls, and top each with a portion of chicken. 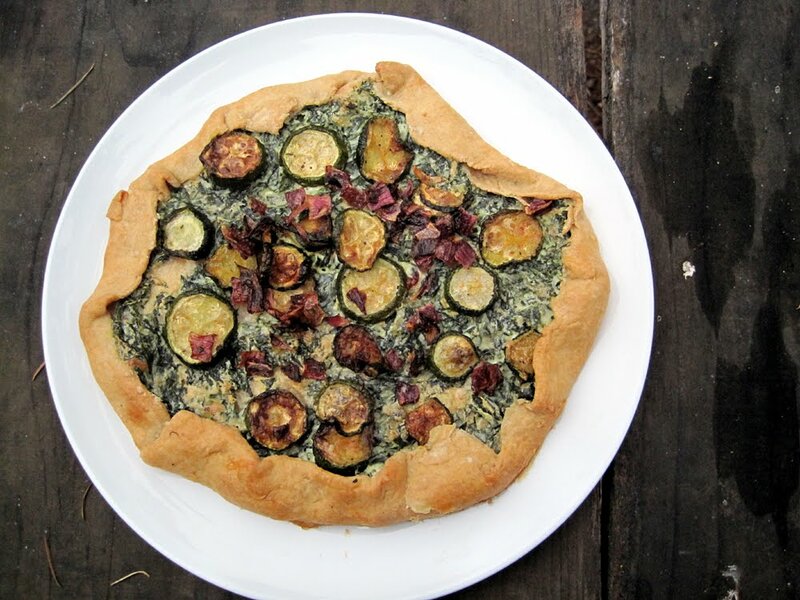 This galette makes for a super delicious (if not particularly easy) dinner, and it's easy to scale up or down for however many people you're cooking for. I made two individual-sized galettes just because that's more fun, but you could actually probably serve four with these ingredients if you served it with a big salad or a hearty soup. I'd recommend going all-out and making your own ricotta if you have time, because it really adds something special - but that's an easy shortcut if you're low on time. I went for this oil-based half-whole-wheat crust to try and make the galette a bit healthier, but I don't necessarily recommend it. It wasn't bad, but it was a little tough and just overall didn't have a great texture. Other than that, though, this was a real winner. The kale-ricotta filling is extremely tasty, and it's topped with nicely caramelized onions and zucchinis. If you have some extra time some evening, you should definitely give it a try! 1. Preheat the oven to 425 degrees. Toss the squash and onions with olive oil, and then season with salt and pepper. Roast about 25 minutes, until browned and cooked through. Turn the oven down to 375 degrees and leave it on while you finish the galettes. 2. Meanwhile, heat some olive oil in a non-stick skillet. Add the kale (in batches if necessary), and season with salt. Cook until tender, and then transfer to a paper towel-lined colander. Drain and allow to cool for a few minutes, then press down on the kale to remove as much liquid as possible. Finely chop. 4. Make the crust. Whisk together the flours and salt, and then stir the oil in with a fork. Add the water, and stir with a fork until the dough comes together. Divide in half, and roll each half out relatively thinly (as desired). 5. 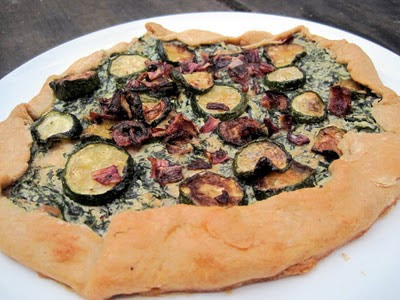 Spread half the ricotta-kale mixture on each crust, leaving a border around the edges. Top with the squash-onion mixture. Fold the edges of the crust over the filling. 6. Whisk the remaining egg with a bit of water, and brush onto the crust. 7. Bake the galettes at 375 degrees for about 25-30 minutes, until the crust is browned and the filling is bubbling. Wow, this is an old recipe, all the way back from this past January! Somehow I never managed to get it posted through the spring, and then it didn't seem appropriate for summer months. Now that fall is rolling around, though, it's definitely one you won't want to miss. The cheddar biscuits on this chicken pie are amazing - flavorful, cheesy, and tender. 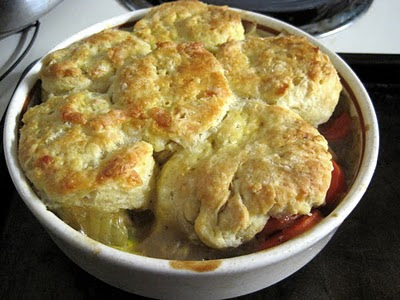 They top the filling of a chicken pot pie, without all the trouble of making and rolling out a pie crust. This is definitely the recipe to turn to when you're in the mood for comfort food - it's warm, filling, and oh-so-delicious! 1. Make the filling: Bring the chicken broth to a boil in a large pot. Add the carrots, potatoes, and celery and simmer uncovered until the vegetables are just tender, about 10-15 minutes. Transfer the vegetables with a slotted spoon to a large bowl, reserving the broth, and add the chicken to the bowl. 2. In another saucepan, cook the onion in the butter and olive oil over moderately low heat, stirring, until it is softened. Add the flour and cook, stirring, for 3 minutes. Add 3 cups of the reserved broth in a stream, whisking, reserving any remaining broth for another use. Bring the mixture to a boil, whisking. Add the thyme and simmer the sauce, stirring occasionally, for 5 minutes. Stir in the nutmeg, parsley, and salt and pepper to taste, pour the sauce over the chicken mixture, and stir the mixture gently until it is just combined. 4. Make the biscuit crust: Sift together the flour, baking powder, baking soda, and salt into a large bowl. Add the butter and the shortening, and cut in until the mixture resembles meal. Add the Cheddar and toss the mixture. 5. Into a liquid measuring cup break the egg and add enough of the buttermilk to measure a total of 1/2 cup. Beat the buttermilk mixture with a fork. Form a well in the middle of the flour mixture, and pour in the buttermilk mixture. Stir just until the mixture forms a dough, gather into a ball, and pat out to 1/2-inch thick on a floured surface. Cut out as many rounds as possible with a 2-inch round cutter dipped in flour, gathering the scraps and patting the dough out again in the same manner. 6. Arrange the rounds on the chicken mixture, brush the tops of the rounds with the egg wash, and prick the rounds with a fork. Bake the pie in the middle of a preheated 450 degree oven for 15 to 25 minutes, or until the biscuits are puffed and golden and the filling is bubbling. I made these cupcakes for a community gardening group that came to our house to help us fix up the yard. We spent the afternoon chopping back ivy, pulling weeds, and covering the front yard with compost so it will be ready to plant with beautiful flowers and herbs. We took a break in the late afternoon for Sweet Potato-Black Bean Chili, roasted veggies marinated in balsamic vinaigrette, and these cupcakes. I wanted to make everything vegan since I wasn't sure what the folks at the garden party would like, and the meal turned out really well! These cupcakes were fantastic - despite the lack of dairy products, they were super moist and flavorful. They taste pretty much like these Martha Stewart cupcakes, but are just a bit more fragile - I had to be very careful getting them out of the pan. 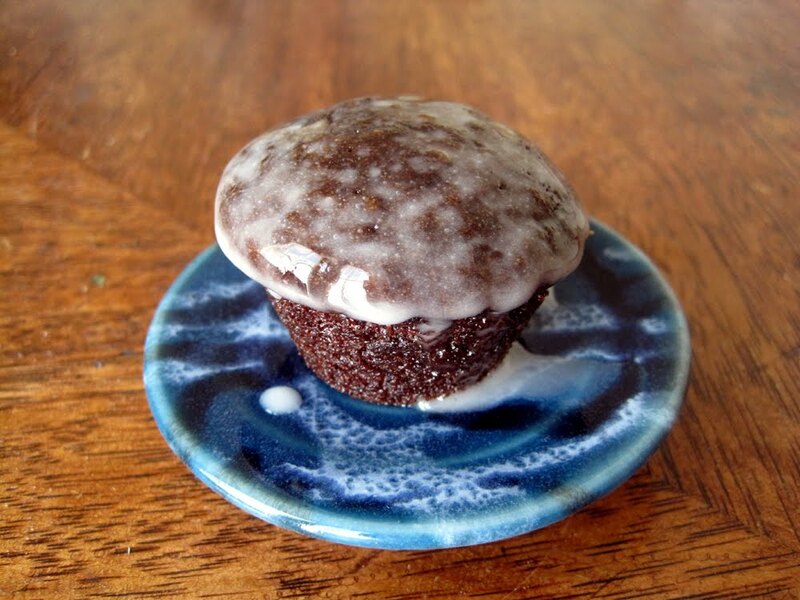 If I made these full-sized, I would definitely use cupcake papers rather than just spraying the pan. I'm not a big fan of margarine, so I went with a simple glaze rather than a faux buttercream. I like the way the sour lemon glaze sets off the richness of the chocolate. 1. Preheat the oven to 350 degrees, and spray 24 mini muffin cups (or 12 regular-sized muffin cups) with oil. 2. Whisk together the coconut milk, oil, vanilla, and sugar in the bowl of a stand mixer. In a separate bowl, whisk together the flour, almond meal, cocoa powder, baking soda, baking powder and salt. 3. Add the dry ingredients to the wet, and beat on slow speed with the mixer until just combined, being careful not to overmix. 4. Divide the batter among the muffin cups, and bake until a tester comes out clean (15-ish minutes?). Whisk together about 1/4 cup powdered sugar and some lemon juice until smooth. Add more lemon juice or water as needed to get a glaze consistency. Dip cooled cupcakes in the glaze. One of my new housemates asked me to make this recipe from a cookbook he brought home from a conference. I was only too happy to agree, because the recipe looked amazing! The bread pudding itself is easy to put together -- not too sweet, perfectly custardy without being overly soggy or dry, and with nice bits of chocolate sprinkled throughout. What sets this bread pudding apart is really the presentation. 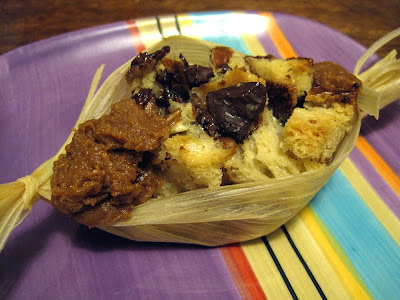 After you bake the pudding, you let it cool slightly, slice it into 9 squares, and wrap each one up in a corn husk like a tamale! This makes the bread pudding much neater and more special than the usual sort, which usually isn't a particularly fancy dish. I did have a big failure with this dish, which was trying to make my own cajeta. I overcooked the caramel and ended up with candy instead of a caramel sauce! Caramel is tough to make - I've managed to make it properly maybe two or three times, but there have been many more attempts than that! In this case, at least it didn't burn, so we were able to cut it into squares after it hardened and enjoy it as candy - sort of like a praline. It was tasty, but definitely not ideal to serve with the bread pudding. So, unless you're a caramel expert or a glutton for punishment, I'd recommend just thinning some jarred cajeta or dulce de leche to drizzle over the tamales. 1. Soak the corn husks in hot water until pliable, 1-2 hours. Preheat the oven to 350 degrees. Line an 8x8 square pan with foil or parchment, and spray with oil. Set aside. 2. In a large bowl, whisk the eggs. Add the milk and cream, and whisk to blend. Add the vanilla, lemon juice, salt, pecans, and chocolate, and whisk again. Add the bread and fold in with a rubber spatula or large spoon until well combined. 3. Scrape the mixture into the prepared pan, and bake 1 hour, or until a knife inserted in the center comes out moist but clean. Remove from the oven and let cool slightly. 4. Lay 9 of the husks flat on a work surface. Slice the pudding into 9 equal pieces, and place one piece in the center of each husk, spreading it to within about 1 inch of the edges. Use the final husk to tear off thin pieces of husk. Use the thin pieces to tie up each end of the husks in order to form little packages around the bread pudding. Serve with cateja or dulce de leche drizzled on top. I love pancetta - it has all the fantastic pork-y flavor of bacon, but it's so thinly sliced that it doesn't overwhelm a dish (and you also save a few calories). This dish showcases the pancetta perfectly. It adds a wonderful salty note to a simple fish dish. I also love the marinated tomatoes that top the fish. Initially, I was a little worried that the flavors of tomatoes and fish wouldn't go well together, but I don't know what I was thinking! They might be a slightly unusual pairing, but they go together very nicely. Using high-quality heirloom tomatoes here really makes the difference...they pretty much taste exactly like summer! 1. Sprinkle the lemon zest and thyme leaves evenly over the fillets of fish. Season with salt and pepper. 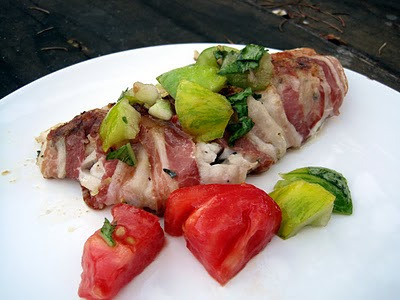 Carefully wrap the pancetta around the fish. Cover with plastic, and let chill in the fridge for a few hours (or all day, if you'd like to prepare the fish in the morning). 2. Remove the fish from the fridge about 15 minutes before ready to cook. Cut the tomatoes into large chunks, and add the olive oil, vinegar, basil, and shallots. Season with salt and pepper, and allow to marinate while you prepare the fish. 3. Heat a non-stick grill pan, griddle, or large skillet over medium-high heat. Spray with oil. Place the fish on the pan, and cook until the pancetta is crispy, 3-4 minutes. Flip the fish, and cook a further 3 minutes. Check for doneness by poking into a piece of fish with a knife and fork, and continue to cook if the fish is not yet opaque on the inside. 4. Serve the fish topped with the marinated tomatoes and a squeeze of lemon juice. This casserole is a great way to showcase whatever summer vegetables you have sitting around. I made it with a bunch of veggies I got at the farmer's market, and tossed in a few leftovers from the fridge as well. Just be sure to keep the fire roasted vegetables and the polenta, and then top with whatever else you like. You could definitely make your own polenta to save a little money, but I opted for the prepared polenta from the refrigerated section at the grocery to save some time. This recipe only uses half a tube, so you can save the rest for breakfast - it's fantastic fried in a bit of butter and topped with syrup or stewed fruit. 2. Heat a little oil in a non-stick skillet. Add the corn and saute for a few minutes, until just tender. Season with a bit of salt and pepper. 3. Coarsely chop the tomato, and then toss in a bowl in about 1 tsp olive oil, salt, and pepper. Julienne the basil, then add to the tomatoes. Let marinate for about 5 minutes while the corn cools off. 4. Toss together the corn, tomato mixture, jalapeno, and kale. Season to taste with salt and pepper. 5. Pour the crushed tomatoes into the bottom of a pie plate. Top with the polenta, spread into an even layer. Pour the veggies over, and spread into an even layer with a rubber spatula. 6. Place the pie plate on a sheet pan, and then bake until bubbly and heated through, about 25 minutes. 7. Serve with burrata or another fresh mozzarella cheese. 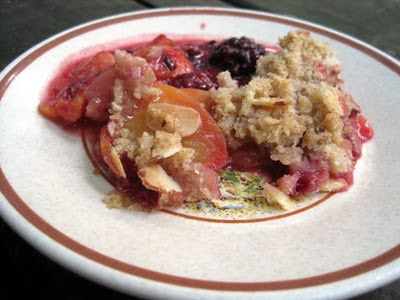 This fruit crisp is a testament to Chez Panisse's philosophy of simple food using local, perfectly ripe ingredients. I made this while visiting my parents in Ohio, using fresh-picked blackberries and peaches from a local orchard right behind my parents' house. They were so tasty that they needed little accompaniment to make a delicious dessert. The fruit is tossed with some flour and sugar, topped with a crunchy almond crisp, and then baked until bubbling. It makes the perfect summer dessert - super flavorful and just bursting with fresh fruit flavor. Use whatever you have on hand - I bet nectarines and blueberries or plums and raspberries would also be terrific. 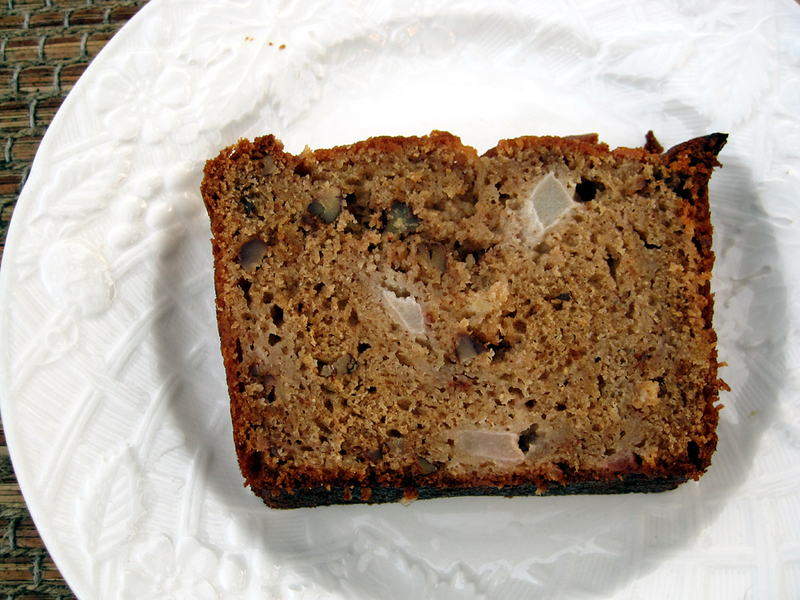 You could even make the filling with apples and a bit of cinnamon in the fall or winter - just be sure to taste and adjust the sugar as needed. 1. Put the flour and sugars in a bowl. Cut in the butter, and then stir in the almonds. Set aside. 2. Toss together the peaches and blackberries, and then toss with the flour and sugar. Turn into a 9-inch pie pan, smooth the top, and sprinkle an even layer of the topping over the fruit. 3. Bake in a 375 degree oven for 35 minutes, until the top is golden brown. 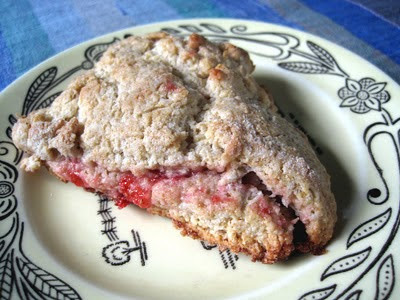 These are some of the most amazing scones I've ever eaten! 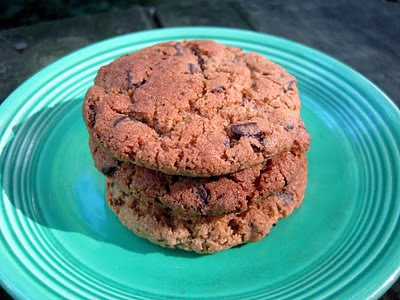 The barley flour adds a fantastic nutty flavor, and I think that having less gluten in the scones makes them extra tender. I love the idea of baking the jam right into the scones - you can use any flavor you like, and the scones will be especially good if you have homemade jam on hand. These are especially good warm out of the oven, but they keep fairly well for a day or two - I'd recommend reheating the scones in a toaster oven before eating them. 1. Preheat oven to 350 degrees. Line a baking sheet with parchment. 2. Whisk together the dry ingredients. Cut the butter into 8 pieces and then cut into the dry ingredients with a pastry blender or two knives. 3. In a small bowl, whisk together the egg and buttermilk. Pour into the dry mixture and mix until barely combined. 4. Transfer dough to a well-floured surface and dust with flour. Divide into 2 halves, and pat each piece into a disk about ¾ inch thick and 7 inches in diameter. Cover one disk with the jam. Top with the other disk and press down gently. Use a sharp knife to cut into 8 wedges. Place on the baking sheet. 5. Bake the scones 22-26 minutes. To keep the scones from sticking, slide a thin spatula under while still warm and place on a cooling rack. 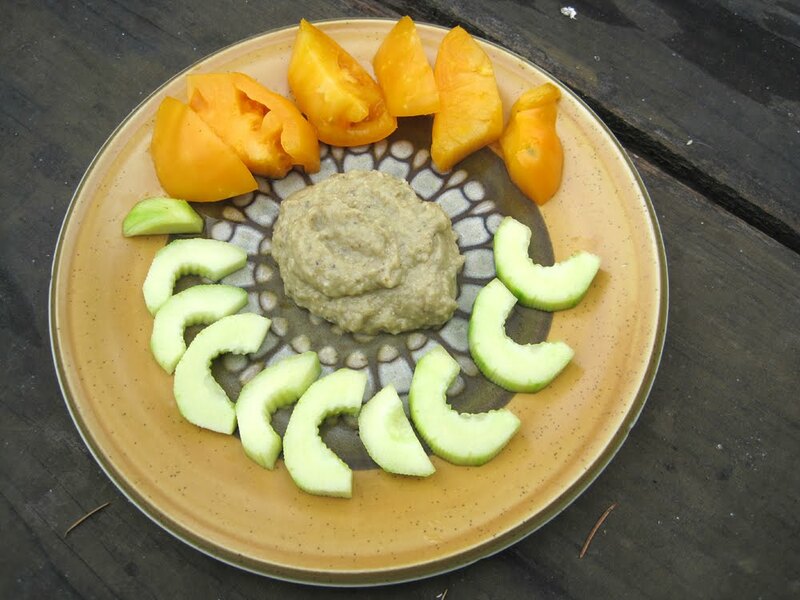 One of my housemates got some eggplants in her CSA box, and I decided to turn them into baba ghanoush. While it wasn't quite as transcendent as the baba ghanoush at my favorite Middle Eastern restaurant, Aladdin's Eatery, it was quite delicious as a dip for heirloom tomatoes and cucumbers. I made my own tahini out of sesame seeds and olive oil because the grocery store was only selling it in huge quantities, and that's definitely the part of the recipe I'd try to improve next time. It ended up a little bitter, I think because I accidentally bought un-hulled sesame seeds. Next time, I'll try it with the hulled variety, because it was definitely a lot cheaper than purchased tahini! Overall, this was a very tasty and healthy dip, and it was a lot easier to make than I thought! 1. Preheat the oven to 350 degrees. Line a sheet pan with foil, spray with oil, and then place the eggplants on the pan. Prick all over with a fork to allow steam to escape. Roast, turning occasionally, until the eggplants are totally collapsed and mushy, about 45 minutes. 2. Allow the eggplant to cool slightly, then cut in half and scrape out the flesh. You should have about 3/4 cup, packed. Place in a colander and allow to drain for 3 minutes. 3. Place the eggplant in a food processor along with the lemon juice, garlic, and tahini. Add a generous pinch of salt and a few good grinds of pepper. Process until the texture is coarse and choppy, then taste and adjust for seasoning. Process until almost smooth. 4. Place in a serving bowl and cover with plastic wrap, pressing the plastic on the surface of the baba ghanoush. Chill at least 45 minutes before serving. I love dishes with just a few simple ingredients that combine to make something extraordinary. Such is the case with these roasted poblano tacos. Even with only four ingredients, these tacos are full of flavor. The peppers are the only time consuming part of the recipe - they take a while to roast, and then getting the skins off is a bit of a pain, but it's totally worth it! The longer you roast the peppers, the easier they'll be to peel. 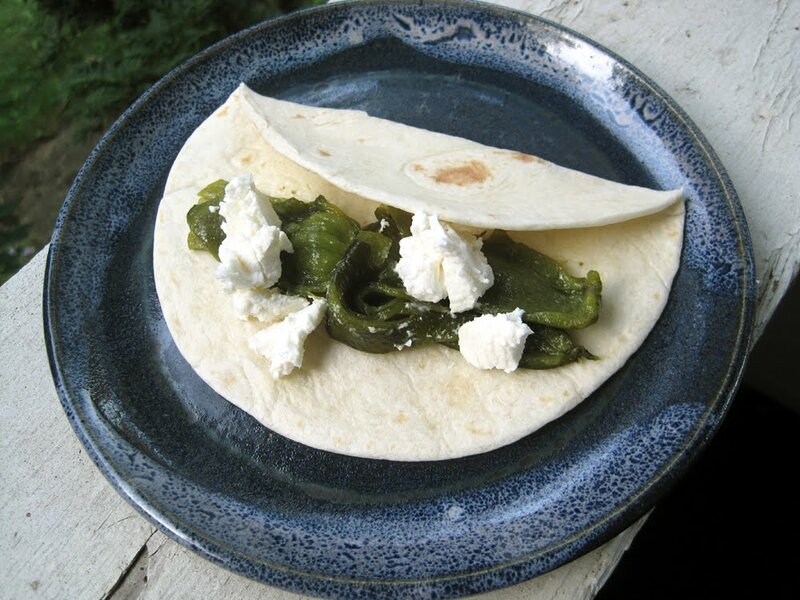 The vegetal, slightly spicy flavor of the peppers is perfectly offset by the creamy, tangy goat cheese. I definitely recommend flour over corn tortillas for this recipe, since the richer, softer texture combines well with the fillings. Preheat the oven to 400 degrees. Toss the chiles with oil and spread in a single layer in a baking pan. Roast about 40 minutes, turning occasionally, until the chiles are charred. Place the chiles in a bowl and cover. Let steam 10-15 minutes until cool enough to touch without burning your fingers. Peel the skins off the chiles and cut into strips. Be sure to remove all the seeds. Heat the tortillas in a pan or oven until warmed through. Fill with strips of chiles and goat cheese. I rooted for Aarti all season on Next Food Network Star, and I was so excited when she won! Her food always looked delicious, and she has such a warm and inviting personality that I can't help wanting to watch more. So, I was glad when the first episode of her new show, Aarti Party aired. I watched it with two friends, and we knew right away that we wanted to make some of the recipes! So, what was the verdict? Did Aarti's recipes taste as good as they looked? For the Sloppy Bombay Joes, I would definitely say yes. 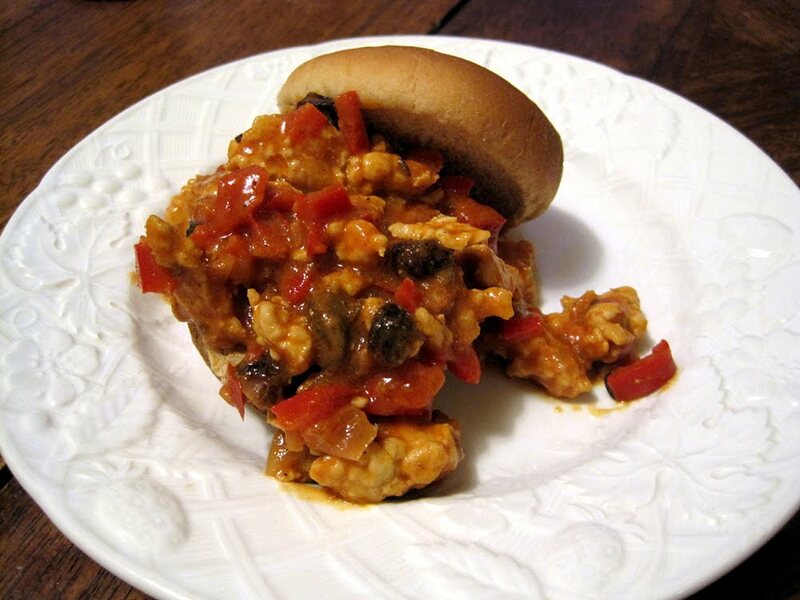 These were a super tasty version of sloppy joes, with lots of good flavor. We particularly liked the addition of pistachios and raisins...they provided little pockets of crunch and sweetness all throughout the sloppy joes. I also liked that the recipe called for ground turkey, which may not be traditional but is how I had sloppy joes growing up. I thought the Massaged Kale Salad was a bit of a mixed bag. We definitely ate it all up, but it was a little sweet for my taste. 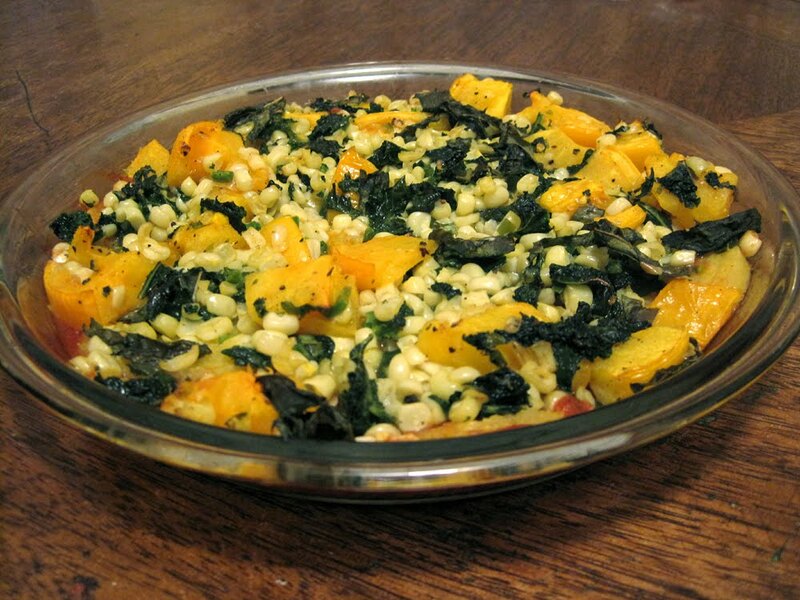 I would definitely make this again, because I love the technique for wilting raw kale and incorporating it into a salad, but I think I would use a different dressing and skip the super sweet mango. I'm imagining a lemon-y dressing with thinly sliced lemon cucumbers and minced olives, or maybe a balsamic vinaigrette with slightly tart quartered strawberries. I'll have to try one of those and report back! Overall, I'd say Aarti's first episode was a winner -- I learned a brand new technique for serving raw kale, and we really enjoyed the dinner prepared from her recipes. Plus, it was pretty healthy - she's not the type of chef who just uses pounds of butter to make her food taste good. I will definitely keep tuning in, and you may see more Aarti recipes here sometime soon! 1. First, get the sauce started. Warm the oil in a large saucepan over medium heat until it shimmers, and then add the ginger, garlic, and chile. Saute until the garlic starts to turn brown, and then add the garam masala and paprika. Saute 30 seconds, and then stir in the tomato sauce and water. Bring to a boil, and then simmer, uncovered, while you finish the rest of the meal. Stir occasionally. 2. While the sauce reduces, make the turkey mixture. Warm half of the oil in a large skillet over medium heat, and then add the pistachios and raisins. Cook until the raisins swell up a bit and the pistachios brown, stirring often and keeping a close watch so nothing burns. Remove from the pan and set aside. 3. Add the remaining oil and heat until shimmering. Add the cumin seeds and saute for about 10 seconds. Add the onion and pepper, and saute until they start to brown. Add the pepper, season with salt, and saute for another few minutes, stirring frequently. Add the turkey, breaking it up with a wooden spoon into smaller pieces. Cook until opaque, about 5 minutes. 4. Add the sauce to the skillet, bring to a boil, and then simmer about 10 minutes, until the sauce is thickened and the flavors are nicely combined. Remove the pepper, and add the honey, half-and-half, and reserved pistachios and raisins. Heat through and taste for seasoning. Serve with toasted buns. 1. 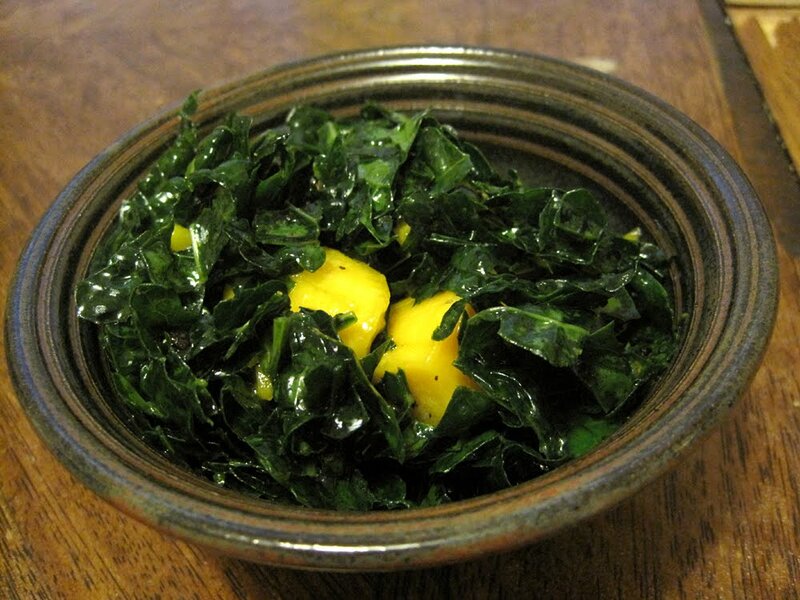 Combine the kale, half the lemon juice, a drizzle of olive oil, and a pinch of salt in a large bowl. Massage with your hands until the kale softens and wilts, 2-3 minutes. Set aside. 2. Combine the remaining lemon juice, olive oil, a pinch of salt, several grinds of pepper, and the honey in a small jar. Screw the lid on tightly and shake until well combined. Taste a little on a bit of kale, and adjust seasoning as needed. 3. Toss the kale, dressing, and mango together in a serving dish. I love butternut squash soup, especially when it's fancied up with other fun additions. This one has fresh corn and roasted cauliflower, both of which pair well with the sweet squash. I like the combination of textures here - the smooth butternut squash base, plus the chewy cauliflower florets and the little bursts of flavor from the corn. The soup also has a bit of smoked Spanish paprika, which is pretty much my new favorite spice. It adds fantastic flavor to almost any savory dish. I actually picked this recipe because I wanted to try out my new immersion blender - which I'm loving! So much easier for pureeing soup than transferring hot liquid into the blender and managing to spray myself with it half the time. Plus, it's easy to clean, which is always an improvement in my book. However, you can easily make this soup in the blender as well; just be sure to let the soup cool a bit first. 1. Preheat oven to 400 degrees. Toss the cauliflower with oil, salt, and pepper, and roast until tender. 2. Meanwhile, heat some oil in a Dutch oven or large saucepan. Add the leeks and cook for about five minutes until they start to become tender. Add the garlic and saute for another minute or so. Season with salt and pepper, and add the butternut squash and chicken broth. Bring to a boil, and then simmer until the squash is tender. Puree either with an immersion blender or a regular blender (if using the latter, be very careful!). 3. Add the paprika, corn, roasted cauliflower, and coconut milk, and return the soup to a boil. As soon as it is hot, taste and adjust for seasoning, and then serve. 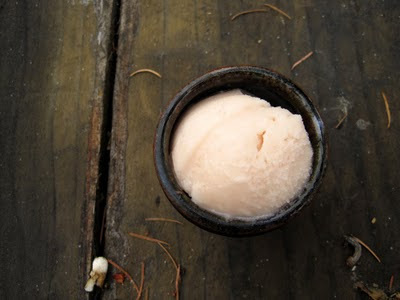 I love sherbets - not as rich as ice cream, but creamier and smoother than sorbet because of the addition of a little whole milk. This nectarine sherbet preserves the perfect flavor of summer in a cold dessert. It's fantastic on its own, but is also particularly tasty on top of a warm brownie. I think you'd get a pinker result if you cooked the nectarines with the skins and then strained them out, but I didn't want to do that much work, so I just peeled the fruits first - either way this makes an excellent end to a meal. 1. Place the nectarines and water in a saucepan. Cook, stirring occasionally, until the nectarines are softened, about 8 minutes. Add the sugar, and continue to cook until the sugar is dissolved. Let cool. 2. Scoop the nectarines into a blender and add the milk. Puree until smooth. Add lemon juice to taste, and blend again to combine. Pour through a sieve just to make sure any bits of nectarine pit are eliminated. 3. Chill in the refrigerator at least four hours or overnight. Freeze in an ice cream maker. My friend Clare got married earlier this summer, and instead of the usual wedding cake, she had her friends bake cupcakes! I thought it was such a fun idea to get everyone involved and save a little money. 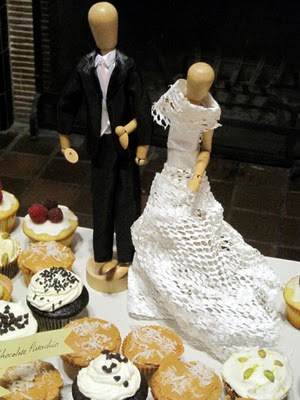 Plus, the cupcakes tasted way better than your usual wedding cake! I was put in charge of finding the recipes, as well as cooking some of the cupcakes. I went for two of my favorite (and relatively fool-proof) cupcakes: Coconut Cupcakes with Dulce de Leche Frosting and Chocolate Cupcakes with Vanilla Buttercream. Although I wasn't responsible for the gorgeous display, I wanted to share it since it was so pretty! 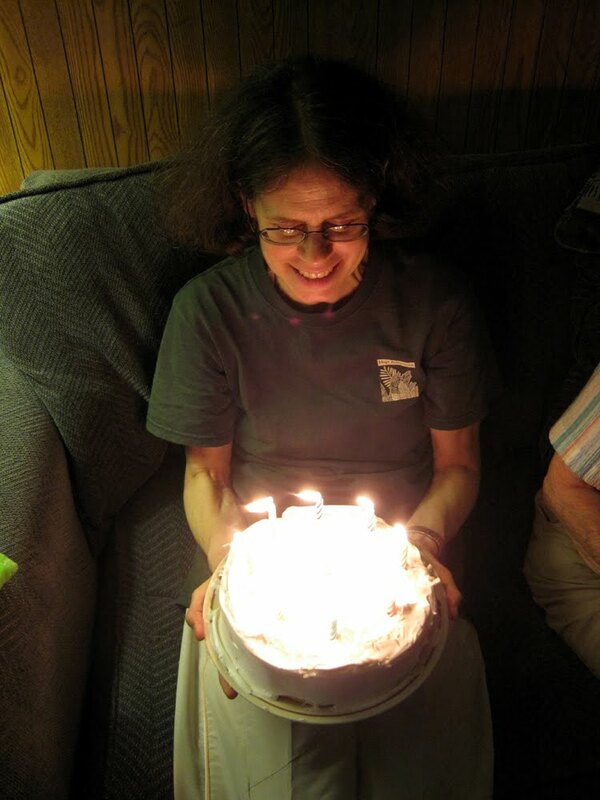 I made this coconut cake for my mom's birthday this year, and I was really happy with how it turned out. 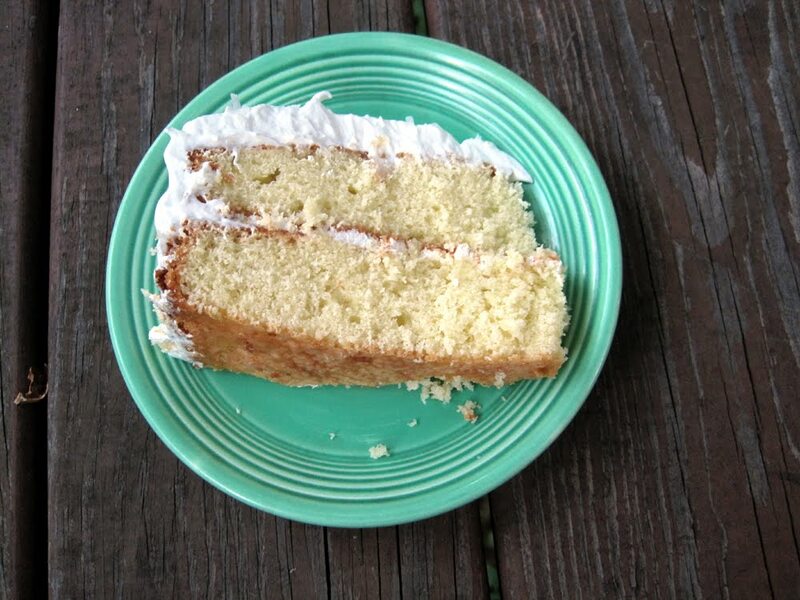 It's nice and moist with good coconut flavor. I'm also in love with the frosting - a simple seven-minute frosting topped with sweetened flaked coconut. This frosting is a lot easier to make if you have a stand mixer; if not I'd suggest finding a friend to help hold the blender while you pour in the sugar syrup. My sister, Anna, was nice enough to help me out with the frosting - and she's holding the cake in the pictures below. This really does make the perfect birthday cake - sweet, festive and delicious! 1. Grease two 9-inch round cake pans and line the bottoms with parchment. Grease and flour the paper and sides of the pans. Preheat the oven to 350 degrees. 2. Heat the coconut milk and flaked coconut until hot. Let cool slightly, and then pulse in the blender until the coconut is finely chopped. 3. Whisk together the flour, baking powder, and salt in a small bowl. 4. Beat the butter until light and creamy. Gradually add the sugar, being sure to beat well. Add the eggs one at a time, beating well after each addition. 5. Add the flour mixture and coconut mixture in alternating additions (flour-coconut-flour-coconut-flour). Beat on low speed between each addition until well blended, and scrape down the sides of the bowl regularly. 6. Divide the batter equally between the two pans. Bake 30 minutes, until browned and a tester comes out clean. Cool in the pan for about 15 minutes, and then invert onto cooling racks and carefully peel off the parchment paper. 7. Frost the cake once completely cooled. Bring the water and sugar to a boil, and then cover and cook without stirring for 1 minute. Uncover, and boil, stirring frequently, until the mixture reaches 230 degrees on a candy thermometer (or until hot enough to spin a thread when dropped from a spoon into a glass of cool water). 8. Meanwhile, beat the egg whites until soft peaks form. Continue to beat on high speed while you gradually add the sugar syrup in a thin stream. Beat about 7 minutes until the frosting is fluffy and completely cooled. 9. 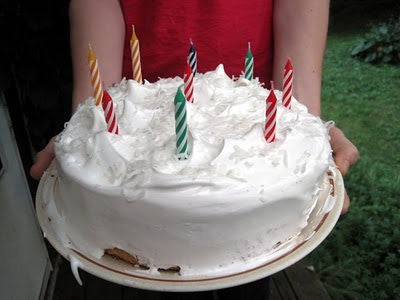 Frost the cake: invert one cake onto a serving plate and frost the top and sides. Place the second layer on top, and frost the top and sides. Sprinkle flaked coconut on top. 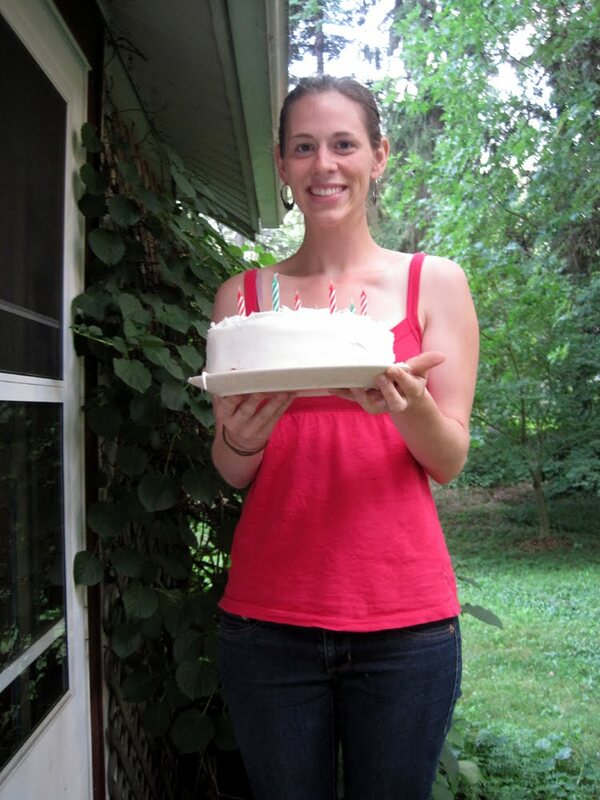 My sister, Anna, with the cake. 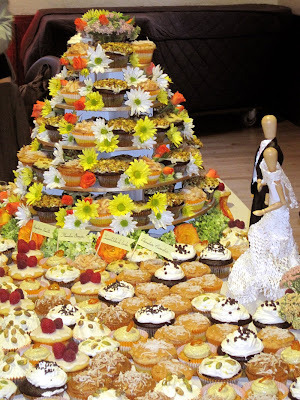 A close-up of the cake.